Slicked hairstyle is one of the best trends of previous season that has survived and this summer too it still looks hot and stylish. Such effortlessly chic and gorgeous hairstyle cannot be just ignored so I decided to introduce you some of the most popular 2015 summer slicked hairstyles from runway shows. Slicked hairstyle can be created on any hair length and haircut be it short or super long hair. 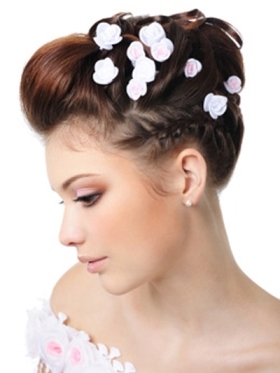 Moreover, anyone can create this easy yet so gorgeous hairstyle. Let’s find out some easy steps on how to create slicked hairstyles. First style that I want to show you is slicked up-do like slicked ponytail, bun or chignon. The most important thing about slicked hairstyle is hair parting. It can be either center or side parting or simply backcombed. The choice of hair parting should be suitable for your face shape. 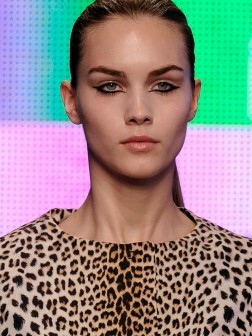 Recently deep side parting has become very popular and this style is more often seen or the catwalk. Such hair parting will add vintage vibe to your image. Looking for party hairstyle and still don’t know what to choose? Let’s turn to celebrities for a dose of inspiration. Checking out one of the latest red carpet events I found a tendency. Recently all celebrities choose vintage and classy designs. Of course there are some that still shock us with their unimaginable and crazy images. But at this time I want to introduce you only classy hairstyles, mainly celebrity bun up-dos for final occasions. Thanks to the group of pro hair gurus our beauty bunnies always look flawless and no wonder why we always turn to them for inspiration. Most celebrity hairstyles are complicated and can be recreated only with the help of professional. Surely you can choose best design and turn to the help of hairdresser but be ready to pay the bill.